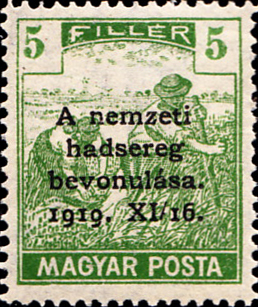 Prior to WW1, Hungary was part of the Austro-Hungarian Empire. 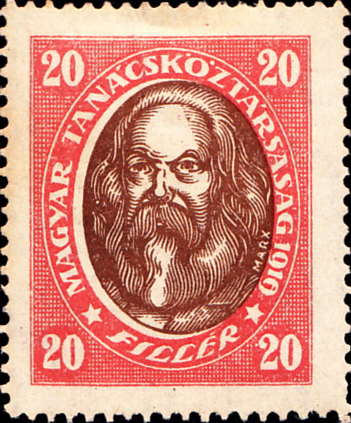 Austrian stamps were first issued in 1850, Austro-Hungarian in 1867 and both were used in Hungary, but (following a set of newspaper tax stamps in 1868) on 1st May 1871 the first stamps designed specifically for Hungary were issued showing emperor Franz Joseph. The first printing was withdrawn because of the poor printing quality of the portrait. Krajczár is the Hungarian form of the Austrian kreuzer. † SG1 and YT1 is the 2k chrome yellow from the 'unissued' first printing. Gibbons notes that some were used in error in Pest in August 1873. Scott mentions and prices but does not number it. All the stamps n the table above are lithographed. There is an engraved set of the same values in similar colours with issue dates from 1871-73. Continuing with the changes of administration, these began with the People’s Republic in 1918, following WW1. 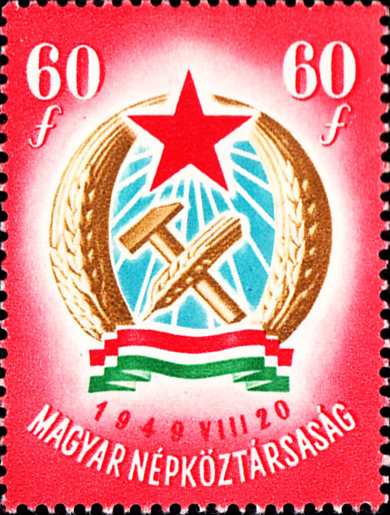 This was followed in June 1919 by the short-lived Hungarian Soviet Republic (stamp depicting Karl Marx), established by the Socialist-Communist coalition led by Béla Kun who fled to Vienna a few months later as Rumanian troops advanced on Budapest. By November 1919, Rumania had withdrawn and the Hungarian army entered the city under Admiral Horthy to establish the National Republic. In 1920 the newly elected National Assembly decided that Hungary was still a kingdom and appointed Horthy as regent. Towards the end of WW2, Horthy abdicated (vice-regent Stephen Horthy had been killed in 1942). A provisional government was established in December 1944 under ‘Soviet auspices’, a Republic in 1946 and the People’s Republic (soviet style) in 1949. 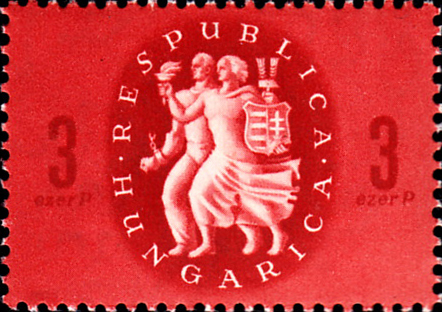 Gibbons  describes this set of overprints as those of the Hungarian National Government, led by Admiral Horthy and set up in Szeged (which was under French occupation) in opposition to the Bolshevist régime. The Gibbons listing starts with three semi-postal stamps, SG1-3, Sc11NB1-3. Areas of Hungary were occupied by French, Rumanian and Serbian forces after WW1 until the territorial disputes were settled by the Treaty of Trianon in June 1920. 1919 Sc-1N1 SG4 19 Sc-10N1 SG1 1919 Sc-2N1 SG1 1919 Sc-4N1 SG1 1919 Sc-7N1 SG1 1919 Sc-9N1 SG? 19 Sc-5N1 SG? 19 Sc-6N1 SG? Arad - Gibbons start its listing with three semi-postal stamps. The area was awarded to Rumania. Banat Bacska - was shared between Serbia (west) and Rumania (east). .
Debrecen - Scott has two separate Debrecen series, 2Nx and 3Nx. This remained in Hungary. Temesvar originally occupied by Serbia and and then by Rumania. 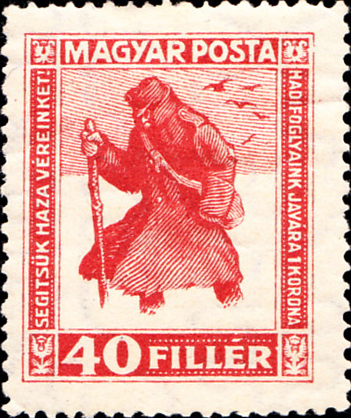 Gibbons lists the other stamps, but not SG1. There was such variation in the designs of these surcharges that the whole Scott set is shown here. Temesvar was awarded to Rumania and renamed Timisoara. Transylvania - not found in Gibbons. 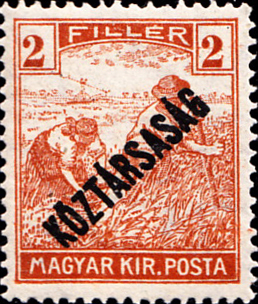 Scott has two issues, Kolozsvar (or Cluj 5Nx) and Nagyvarad (Oradea 6Nx). Baranya - Scott lists two issues, 7Nx and 8Nx. 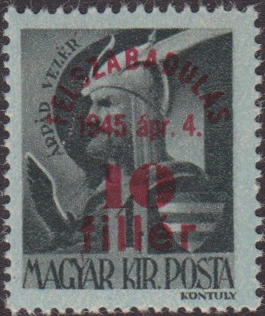 Most of the region remained in Hungary, a small part in the south was awarded to Serbia. Sources: MiK, ScC, SGP2 , YTC. Images from David Olson, TB, NB, ebay.